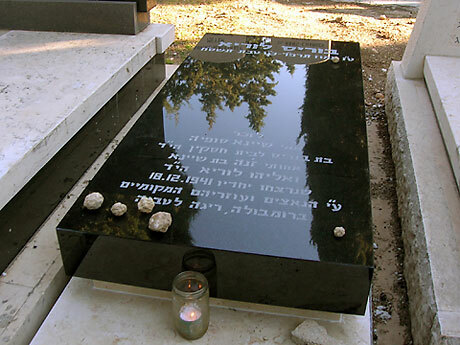 "birth & death dates according to the jewish calendar"
I am grateful for this information— (see below— the wording on Boris's grave stone is an unfortunate mistake— and this mistake should be addressed— the wording needs to be corrected— this gravestone of Boris's is a historical record with misinformation on it. A part of my own artists code of living life as an artist— art is life and life is art— has connected to it— a mystical concept dealing with the idea of creation-— will get into this at another time— but I do keep as one of my goals the commitment of helping get Boris the recognition he deserves. For me— he is one of the great 20th century masters. I am sure in the future there will be people who make the pilgrimage to his grave— the information has to be correct— it cannot be any other way— this is wrong— how do we go about changing this? If need be I can contact people in NYC— a person I am working with in the LES Jewish history book is a professor at Yeshiva University. She is an expert in matters pertaining to cemeteries— graves— rituals— rites and so on— I can speak to her— and I know a man who makes the gravestones for NY Jewish cemeteries. But lets correct this error. You never answered me if you contacted the art historian & newspaper journalist from Tevevi.. I showed her your video -— she may have a copy— & she truly appreciates Boris's art— and liked your film— NO!art Man. Since we understand the mistakes on Boris's gravestone, we should get it corrected. My friend from Yeshiva university sent the following observation. The essence of her follow-up question is related to religion. My question: is anyone saying kaddish for Boris? Should someone say kaddish for Boris? If the answer is no fine, but if people think that someone should say kaddish, I know a way to get this done by some hassidic sages. Estera— Who can answer your question? In this case the obvious person is Mr. Nadelman. He pays the bills. And whenever I ask a question, if I ever get an answer, it is almost never a straight answer. Yes you are right about "Shoah"— my point is— everyone— from the orthodox to the atheist— seems confused by some parts of the writing— there are questions. Mr. Nadelman probably is not an expert on the proper form of gravestone writings— lets decide on one authority who can answer these questions and get this job done. I do not accept that there are mistakes, even if minor ones— fix them and let's move on. If the stone needs to be redone— then do it. My question is— who is in charge? It is a sad day for Boris if there is no strong leadership or direction. We are talking about a simple gravestone— from here we go to the work— the legacy— his place in history— What a mess! Is there no one out there is TVland other than Estera and thankfully Ami? Toward that end, and with the proviso that I know I could be wrong (although I was tri-lingual as a child, my hebrew has long since atrophied), I've pasted in a short paragraph of a note I recently sent to Matthias while he and I were communicating about other things not related specifically to Boris (something he and I have regularly done since first we became friends and shared resources as we were working on our two, back-to-back, international retrospective exhibitions on Boris and NO!). I think it explicates what your friend at Yeshiva University also tried to explain about how official Hebrew names appear on gravestones. I wrote: "Official Hebrew names, in these formal ritualistic environments, are always written: "[so and so] Son or Daughter of [so and so]. That's what the hebrew text on the stone (and not the loose translation that was circulated) actually says. It doesn't say that Boris' father was murdered in 1941; it says that his wife and daughter were. Put as directly as is possible, it's right. (Please note that the grammar is also different in hebrew, than in Ami's loose English translation.)" Now on to some of the other issues Clayton brought up: It also seems to me, that the hebrew death date, listed at the top of the stone is also correct (according to this year's Jewish calendar) but again I'm certainly not sure. It would appear with exactly the same characters, were it listed separately, in Hebrew, to commemorate Boris' Yahrzeit date (as is custom here in the US). Put simply, the existing day of death and can, I believe, serve the same purpose; that is to say, to remind people of the date on the Jewish calendar when they should light his yearly memorial candle and say Kadish. As far as I know, exactly where this date should be positioned is not set in proverbial stone (please excuse the pun), although in the States it tends to appear, in hebrew, as the second line from the bottom. I think a Rabbi, familiar with Israeli protocol for such things, should check the existing stone before anyone does anything. (Not the translation that was circulated, but the actual text as this appears, quite legibly, in the images Ami shared.) I, for one, do not think that anything does, if Boris' date of death is correct. On the other hand, I think Clayton is right that it would be great if someone said Kadish for Boris, particularly in view of the fact that our friend doesn't have any natural-born descendants. (Here again I guess I was less than clear when I wrote about remembering Boris in a "familial" way, in my last note.) Arranging to have someone like Clayton's Hasidic contacts assume responsibility for this annual ritual is often done and is a great idea. Usually, I think a donation to a shul or synagog is given, but then again, I could be wrong. What about also finding out if Boris' religious friend (who Ami mentioned) is saying Kadish for him now? Sorry I was away for few days, I have some answers for your questions. I was quite surprised by your Judaism concerns.. but it's understood, we all know Boris was notonly great NO!Art thinker, but he was also a great (NO! )zionist, (NO! )ideologist and a (NO!)Jew! I spoke with Mordechai Starobin today on the phone, Boris childhood friend from Riga, who lives near Haifa. Him and Boris wrote the words on the gravestone together, that was long time ago, Mordechai couldn't remember when, and if he did took part in the writing with Boris or not... That's what he thinks, That's what he remembers. I guess Boris probably wrote himself the text (in Hebrew, Latvian or Russian) and Mordechai did the hebrew corrections for him— Or Borisjust mentioned what he wants to be written, and Mordechai put it down in words, either way it's cool with me— as for the text (according to tradition) ... is correct ! Boris didn't have another name or second name, it was just Boris... Mordechai was the one who said Kadish on Boris, on the funeral day. Actually we were Lucky to have Mr. Foox with us (his father was a close friend to Boris, and so was he), Itzak Foox is a religious man, and made sure everything was done, was Kosher... all the other attendances just like me, don't know much about it. Foox was the one who made most of the arrangements, the telephones, the contact at the airport and "Hevra Kadisha", the order of the gravestone and more. Nobody came from New York with the body, and that was a shame... I expected someone will come. The gravestone was made by Boris wish, to match the gravestone of his Father, black stone with the same letters print. Now, as for the text — reading it few times, over and over (in Hebrew), It did make sense to me eventually. Like I said before, there is not a mistake with the text, the names, the hebrew (only Hebrew) dates, are all correct. There is just a confusion, if you read it in Hebrew... (no dots or comas are written), One can think Boris's Mother, Sister & Father were all murded together.I'm sorry I brought this subject up... because once you read it again (and again), you understand. the father name can confuse you, because it's on a new line, and it seems he is separated. but his mention there is only as the father of Boris's sister.... Confusing??? About the actions in Riga, Mathias asked about it. Mordechai said There were two, "big actions" like you mentioned the second one took place on the 8th and on the 9th of January. But Boris knew when the family was taken out from the ghetto. and it was on the first action.